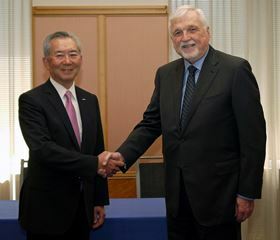 Toshihiko Kai (left), president and CEO, Nikkiso Co Ltd and Ross Brown (right), CEO and majority shareholder, Cryogenic Industries. The Ebara submersible motor pump before it was shipped to Nevada. Nikkiso Co Ltd enters into an agreement to acquire the business and trademarks of California, USA-based Cryogenic Industries Inc, including ACD LLC, Cosmodyne LLC, Cryoquip LLC and Cryogenic Industries AG and their 18 subsidiaries, in a deal worth around US$438 million. 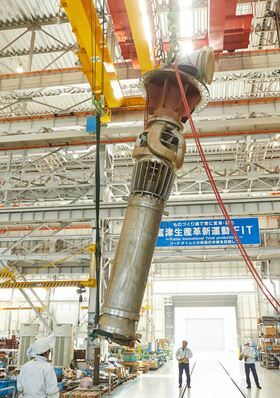 Ebara Corp provides a submersible motor pump with an output of 3350 HP (2500 kW) for a pump station that supplies water to Las Vegas in Nevada, USA. Valve manufacturer Circor International Inc signs a definitive agreement to acquire Colfax Fluid Handling (CFH) from Colfax Corp in a US$855 million cash and stock deal. Flowserve Corp appoints R Scott Rowe as president and CEO of the company from 1 April 2017. Rowe most recently served as president of the Cameron Group, following the merger of Schlumberger with Cameron International Corp.
Wilo USA LLC takes over the operative business of US pump producers Weil Pump Co Inc and Scot Pump Co and the component manufacturer Karak Machine Corp. The three companies, which together employ around 140 people, have their headquarters and production facilities in Cedarburg, Wisconsin, USA. Colfax Corp enters into a binding agreement to purchase Siemens Turbomachinery Equipment GmbH (STE) from Siemens AG in a €195 million deal. Siemens Turbomachinery Equipment develops, produces and distributes single-stage compressors and small steam turbines for environmental and industrial applications. Ruhrpumpen inaugurates a new purpose-built manufacturing plant in Chennai, India. The new plant, which replaces the company’s existing facility in Chennai, provides manufacturing and test lab capabilities and a technically advanced centre for the assembly of the entire Ruhrpumpen product range. The following business news stories were the most popular with visitors to the World Pumps website during 2015. The following business news stories were the most popular with visitors to the World Pumps website during 2014.